Kiko Milano is a quick-drying Smart Nail Lacquer made with the special formula and ingredients that set the colour in just a few seconds. The lacquer's smooth texture allows for a flawless application. The formula & ingredients boost the lacquer & shine for a extra-bright finish. With a brand-new, modern design, the see-through glass bottle has a black matte cap with the KK logo embossed on the top. Thanks to the large, bristle-packed brush, it's simple to take the perfect amount of product and brush it evenly on the nails without leaving streaks. Smart Nail Lacquer allows you to take it with you everywhere to ensure that you always have salon-style nails. 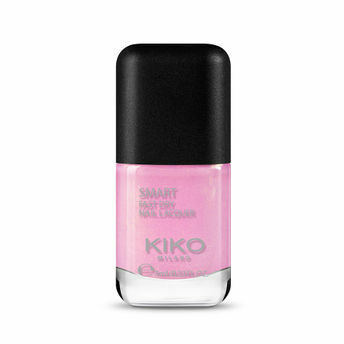 Alternatively, you can also find many more products from the Kiko Milano Smart Nail Lacquer range.